Amish communities can be found in various locations across Illinois, with the largest settlement lying in central Illinois around the town of Arthur. A number of Amish and non-Amish-owned venues sell Amish products including foods, produce and baked goods. Find one in your neck of the woods in the listings below. Know of a good IL Amish market? Let us know in the comments section. Variety store, grocery store, carries broad choice of products both Amish and non-Amish made. 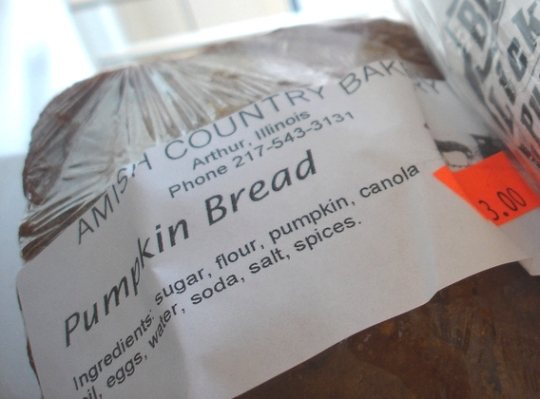 Arthur Amish homemade pastries, fresh pies, flours, spices, candy and groceries. Restaurant, bakery and gift shop. Restaurant serving Amish-style meals. Amish farm and apple orchard. Broad choice of fruit and vegetables, honey, apple butter, maple syrup, country-cured meats, different cheeses, fresh baked goods and more. Amish quilts, wood crafts, food products and souvenirs. Amish/Mennonite home cooking, pies, rolls, lunch and dinner buffet. Gift shop. Local Amish-made jams and jellies, popcorn and quilts among a large selection of Amish handcrafted furniture. Small family business operated by a mother and daughter. They carry a wide selection of Amish products from Shipshewana community in Indiana. Amish Healthy Foods offers natural fed/free-range meats, cheeses, raw products, organic milk, eggs, organic fruits and vegetables, cookies, candy, baked goods and more. Seasonal source for flowers, plants and field fresh produce. Some Amish homemade items available including jam and jellies, no-sugar jams, apple butter, homemade fruit butters, homemade mayo and mustard, pie fillings and more. Bakery and deli, founded by Amish from northern Indiana. Currently non-Amish ownership, with original owners active in the business. Various Chicago locations. Looking for an Amish market in another state? Try the full Amish Market State Listings. Catch us in the main lobby from 7:00 AM until sold out! Located near the corner of Michigan & Wacker. Between Canal St. and the river. Enter the building from either Van Buren or Jackson. You can find us in the south side of the main lobby. Located at Metra Station 173rd & Oak Park Ave. 17116 Oak Park Ave. Open from 7:30 AM until Noon. Please provide me with the information concerning the style of headwear used for work and dress in the Illinois Amish Communities, primarily the Arthur Amish community. Please provide with the most common types of work and dress headwear worn by the Illinois Amish primarily in Douglas county.